In 2008, average collectively agreed weekly working time in the European Union stood at 38.6 hours; agreed normal annual working time averaged about 1,740 hours. Of the three economic sectors examined in this study, agreed weekly working hours are highest in metalworking (38.7), followed by the banking and local government sectors (both 38.3). Average collectively agreed paid annual leave entitlement was 25.2 days across the EU in 2008, although the total varied significantly between the ‘old’ and the new Member States. This report also examines statutory working time and leave limits, and actual working hours. This annual update looks at a number of aspects of the duration of working time in the European Union and Norway in 2008, based on contributions from the European Industrial Relations Observatory (EIRO) national centres. The study examines the following issues: average weekly working hours as set by collective agreements – both at national level and for three specific economic sectors; statutory limits on weekly and daily working time; average actual weekly working hours; annual leave entitlement, as set by collective agreements and law; and estimates of average collectively agreed annual working time. the differing roles of collective bargaining and legislation, with the latter having an impact on actual hours in some countries, but acting only as a maximum ‘safety net’ in others. Figures for normal weekly working hours are also problematic when comparing working time between countries, as they do not take into account factors such as overtime or the length of annual and other forms of leave. Collective bargaining plays an important role in determining the duration of working time in most of the countries considered in this study, albeit to a lesser extent in some of the new Member States (NMS) that joined the EU in 2004 and 2007. However, the nature and extent of this role differs widely between countries, with various bargaining levels – intersectoral, sectoral or company – playing different parts, and bargaining coverage varying considerably. This coverage is generally higher in the 15 Member States that constituted the EU before the enlargement of 1 May 2004 (EU15) than in the 12 new Member States that joined in 2004 and 2007 (NMS12). Furthermore, the importance of bargaining differs greatly between sectors of the economy and among groups of workers. The relationship between bargaining and legislative provisions on working time also varies between countries. Figure 1 outlines the average normal weekly working hours in 2008 for full-time workers, as set by collective bargaining at national level for the 28 countries examined. Note: The data in Figure 1 should be read in conjunction with the notes in Annex 1. See Annex 8 for a breakdown of country groupings. In almost all countries, average agreed weekly working hours in 2008 were identical to those in 2007 (TN0804029S). The only exceptions are a small decrease (- 0.4 hours) in Slovakia and a small rise (+ 0.4 hours) in Spain. Across the 27 EU Member States (EU27), the overall average for weekly working hours remained unchanged at 38.6 hours between 2007 and 2008. The average in the EU15 stood at 37.9 hours in 2008 – the same as in 2007 – while the average in the NMS12 fell very slightly from 39.6 hours in 2007 to 39.5 hours in 2008. The gap between the EU15 and the NMS12 thus narrowed a little to 1.6 hours, or 4.2%. EIRO has now been conducting annual updates on working time for 10 years. Data for the EU15 and Norway have been collected since 1999, over which period average agreed weekly working hours have fallen from 38.6 hours to 37.9 hours, or by about 1.8%. However, most of this reduction in working time occurred before 2003. Since then, there has been virtually no change in the average collectively agreed working time for western Europe, and general reductions in working hours have scarcely featured on the collective bargaining agenda in most countries. This was again the case in 2008, when agreed cuts in working time without loss of pay were virtually absent from the collective bargaining agenda and working time flexibility was also not a prominent bargaining theme, except in Finland and Italy. Since 2003, EIRO has been collecting data on working time for most of the NMS12. Between 2003 and 2008, average agreed weekly working hours in the NMS12 have declined by only 0.2 hours (around 0.5%) – from 39.6 hours to 39.4 hours in the case of the 10 new Member States (NMS10) that joined the EU in 2004 and from 39.7 hours to 39.5 hours in the NMS12. This reflects the fact that most of the NMS12 – Bulgaria, Estonia, Hungary, Latvia, Lithuania, Malta, Poland, Romania and Slovenia – have a 40-hour normal working week. Collective bargaining plays a relatively minor role in setting normal weekly working hours in most of these countries, and collective agreements either do not deviate from the statutory norm of 40 weekly working hours or do not deal with the issue at all. Only in Cyprus, the Czech Republic and Slovakia is the agreed working week shorter than 40 hours, and only Slovakia has registered a decrease in working hours in the past few years. Average agreed weekly working hours in the EU27 and Norway have remained unchanged at 38.6 hours since 2003. While collectively agreed structural reductions in normal working time, without loss of pay for the employees concerned, seem to be forgotten across Europe at present, it should be noted that cuts in working hours of a different sort were becoming increasingly topical towards the end of 2008 as the economic crisis deepened. Enforced reductions in working time – and usually pay – in the form of short-time work and temporary layoffs have been on the increase in many EU countries as companies seek to cope with falling demand. Figures 2–4 below show average normal weekly working hours for full-time workers as set by collective bargaining in three economic sectors selected to represent manufacturing industry, services and the public sector – metalworking, banking and local government. While the more specific sectoral figures below are probably more accurate than the overall average data given in the previous section, caution is again advised in their use, and the notes related to each figure should be taken into account; all the caveats noted above also apply to the sectoral data. Comparing the three sectors, in 2008 the longest average collectively agreed normal weekly working hours in the EU27 were found in metalworking, at 38.7 hours, followed by both banking and local government, at 38.3 hours. Metalworking was 0.1 hours above the average for all sectors, while banking and local government were 0.3 hours below the average. Looking solely at the EU15 and Norway, metalworking again recorded the longest working week (at 38 hours), followed by local government (37.5 hours) and banking (37.3 hours). In the NMS12, agreed weekly working time was longest in banking (at 39.6 hours), followed by both metalworking and local government (39.4 hours). In the NMS12, average agreed weekly working hours are above the average for the EU15 and Norway in all three sectors, although the weekly figures in a number of individual countries of the NMS12 are lower than those found in some of the EU15 and Norway with longer hours. The difference between the average figures for the EU15 and Norway, and the NMS12 is narrowest in metalworking (1.4 hours) and widest in banking (2.3 hours). For the EU15 and Norway, the data series going back to 1999 allows a longer-term view of developments, although it should be noted that the data sources used for the EIRO figures have changed in some countries over the years. In 2008, average weekly working hours had decreased over a 10-year period by 0.4 hours in metalworking (a decline of 1%) and in local government (a reduction of 1.1%), and by 0.3 hours in banking (a decrease of 0.8%). Data collection for the NMS started in most cases in 2003, since then, relatively little change in the sectoral averages has been recorded. In some countries, average agreed weekly working hours vary little across the sectors examined or indeed, it appears, most of the economy. A uniform 40-hour working week, which is usually also the statutory normal week (see next section), applies in most of the NMS12; this is the case in Bulgaria, Estonia, Hungary, Latvia, Lithuania, Malta, Poland, Romania and Slovenia. A similar uniformity in terms of sector applies, albeit at a lower level, in Denmark (37 hours), France (35 hours) and Norway (37.5 hours). There is relatively little variation in Austria, Cyprus, Finland, Ireland, Luxembourg, the Netherlands, Slovakia, Spain and Sweden, none of the three sectors examined differing by more than two hours in these countries. However, wider sectoral differences exist in Belgium, the Czech Republic, Germany, Greece, Italy, Portugal and the UK. Figure 2 below shows collectively agreed normal weekly working hours in the metalworking industry, based on relevant sectoral collective agreements, except where specified otherwise in the notes relating to the figure (see Annex 2). Figure 2 provides data for 2008; virtually no change was reported from the 2007 level in most countries, with the exception of slight increases in Finland and the Netherlands and modest decreases in the Czech Republic and Slovakia. Across the EU27, the average agreed weekly working time in metalworking stood at 38.7 hours in 2008; this is 0.1 hours or 0.3% higher than the overall average for the entire economy. In 2006, when EIRO last examined working time in the metalworking sector, the average agreed weekly working time stood at 38.5 hours. However, the figures are not exactly comparable, as data were not available for all countries in 2006, and the data sources used for the EIRO figures have changed for several countries over the years. In the EU15 and Norway, average weekly working hours in metalworking stood at 38 hours in 2008. This corresponds to a decrease of 0.4 hours or around 1% since 1999, the first year for which EIRO collected data on this sector. An appreciable reduction in the sector’s weekly working hours has been recorded in Finland and France over the 10-year period, as has an upward movement in Luxembourg and the Netherlands; however, this may to some extent be due to changes in the data sources used. In the EU15 and Norway, in 2008 the longest weekly working hours in metalworking (40 hours) were found in Greece, Italy, Portugal and Sweden and the shortest (35 hours) in France and Germany. Working hours in metalworking are markedly higher than the national average for the entire economy in Italy, the Netherlands, Portugal and Sweden, and notably lower than the national average in Germany, Finland and Luxembourg. Overall, the average agreed working week in metalworking in the EU15 and Norway, at 38 hours, is 0.1 hours or 0.3% above the average for the whole economy (37.9 hours). In the NMS12, average weekly working hours in metalworking stood at 39.4 hours in 2008 – that is, 0.1 hours higher than in both 2006 and 2003 (the first year in which data was gathered for most of the NMS12). However, it should be noted that the 2006 and 2003 averages are for a smaller number of countries. The 2008 average of agreed weekly working hours in metalworking for the NMS was 1.4 hours (3.7%) above the EU15 and Norway average for the sector and 0.1 hours (0.3%) below the entire-economy average for the NMS12. Average weekly working hours are at or below the average figure for the EU15 and Norway in Cyprus, the Czech Republic and Slovakia, while they stand at 40 hours in all of the other NMS12 – that is, two hours more than the EU15 and Norway average. In the Czech Republic and Slovakia, weekly working hours in metalworking are below the national average for the entire economy, while in the other countries they are the same as the national average. Note: The data in Figure 2 should be read in conjunction with the notes in Annex 2. Figure 3 below indicates the collectively agreed normal weekly working hours in the banking sector in 2008; the data are based on relevant sectoral collective agreements (except where specified otherwise in the notes in Annex 3). There was virtually no change from 2007 in any country, with the exception of Slovakia where a slight increase in the collectively agreed weekly working time was recorded. In the EU27 as a whole, the average agreed weekly working time in banking was 38.3 hours in 2008. This is 0.3 hours or 0.8% lower than the overall average for the whole economy in the EU27. In 2006, when EIRO last examined working time in the banking sector, the average agreed weekly working time stood at 38.1 hours. However, these figures are not exactly comparable, as data were not available for all countries in 2006, and the data sources used for the EIRO figures have changed for several countries. In the EU15 and Norway, average weekly working hours in banking stood at 37.3 in 2008 – a decline of 0.3 hours or around 0.8% since 1999, the first year for which EIRO collected data on this sector. There have been notable reductions in working hours in Belgium, France and Greece over the past decade and increases in the Netherlands and Spain; however it is not clear to which extent this reflects changes in the data source used. In the EU15 and Norway, in 2008 the longest weekly working hours in banking (40 hours) were found in Luxembourg and the shortest (35 hours) in Belgium, France and Portugal. Working hours in banking are markedly longer than the national average for the whole economy in Germany, Luxembourg, the Netherlands and Sweden, and notably shorter than the national average in Belgium, Greece, Italy, Portugal and the UK. Overall, the average agreed working week in banking in the EU15 and Norway, at 37.3 hours, is 0.6 hours or 1.6% below the average for the entire economy (37.9 hours). In the NMS12, average weekly working hours in banking stood at 39.6 hours in 2008. This is 0.1 hours more than in 2006 and 0.3 hours more than in 2003, the first year in which data were gathered for most of the NMS12. However, it is worthwhile noting that the 2006 and 2003 averages are for a smaller number of countries. The 2008 average of agreed weekly working hours in banking for the NMS12 was 2.3 hours (6.2%) above the average for the EU15 and Norway for the sector and 0.1 hours (0.3%) above the average for the entire economy for the NMS. Average weekly working hours stand at 40 hours – that is, 2.7 hours more than the average for the EU15 and Norway – in all the NMS12 except Cyprus and Slovakia. In the former case, the figure is below the average figure for the EU15 and Norway. In the Czech Republic and Slovakia, weekly working hours in banking are above the national average for the entire economy, while in Cyprus they are below the national average and in the other countries they are average. Note: The data in Figure 3 should be read in conjunction with the notes in Annex 3. Figure 4 below shows the collectively agreed normal weekly working hours in local government in 2008; the data are based on the relevant sectoral collective agreements, except where specified otherwise in the notes relating to Figure 4 in Annex 4. Legislation, rather than bargaining, plays an important part in setting weekly working hours in local government in many countries (see notes to Figure 4 in Annex 4). There was virtually no change from 2007 in any country, apart from western Germany, where a 0.5-hour increase was recorded in some bargaining regions. Across the EU27, the average agreed weekly working time in local government was 38.3 hours in 2008. This is 0.3 hours or 0.8% below the overall average for the entire economy in the EU27. In 2005, when EIRO last examined working time in the local government sector, the average agreed weekly working time stood at 38.1 hours. However, the figures are not exactly comparable, as data were not available for all countries in 2005, and the data sources used for the EIRO figures have changed for several countries. In the EU15 and Norway, average weekly working hours in local government stood at 37.5 in 2008 – a decline of 0.4 hours or about 1.1% since 1999, the first year for which EIRO collected data on this sector. Notable reductions in the sector’s weekly working hours have been recorded in France, Greece and Ireland over the 10-year period, while increases have been registered in Spain and Germany; in the former case, however, it is not clear to which extent this reflects a change in the data source used. In the EU15 and Norway, in 2008 the longest weekly hours in local government (40 hours) were found in Austria, Luxembourg and Sweden, and the shortest (35 hours) in France and Portugal. Working hours in local government are markedly higher than the national average for the entire economy in Austria, Germany, Luxembourg and Sweden, and notably lower than the national average in Greece, Ireland, Italy, the Netherlands and Portugal. Overall, the average agreed working week in local government, at 37.5 hours, is 0.4 hours or 1.1% below the average for the entire economy in the EU15 and Norway (37.9 hours). In the NMS12, average weekly working hours in local government stood at 39.4 hours in 2008. This is 0.1 hours less than in 2005 and 0.1 hours more than in 2003, the first year in which data were gathered for most of the NMS12; however, the 2005 and 2003 averages are for a smaller number of countries. The 2008 average of agreed weekly working hours in local government for the NMS12 was 1.9 hours or 5.1% above the EU15 and Norway average for the sector, and 0.1 hours or 0.3% below the average for the whole economy in the NMS12. Average weekly working hours stand at 40 hours – that is, 2.5 hours higher than the average for the EU15 and Norway – in all of the NMS12 except Cyprus, the Czech Republic and Slovakia, where collectively agreed weekly working hours are around the average for the EU15 and Norway. In Cyprus and Slovakia, weekly working hours in local government are below the national average for the entire economy, while in the other countries they are the same as the national average. Note: The data in Figure 4 should be read in conjunction with the notes in Annex 4. Collective bargaining on the length of working time in the EU Member States and Norway happens within the framework of statutory rules on maximum working hours. These must, as a minimum, respect the provisions of Council Directive (2003/88/EC) on certain aspects of the organisation of working time. Among the directive’s provisions are a 48-hour maximum working week on average over a reference period not exceeding four months, a minimum daily rest period of 11 hours and a daily working hour limit of eight hours for night workers. As Table 1 shows, the countries form two groups – those that set their maximum weekly working hours at the 48 hours specified in the EU Working Time Directive and those that operate a rather lower limit of 40 hours, or 38 hours in the case of Belgium. Note: * No explicit weekly maximum is set in Germany; the 48-hour figure represents an average based on daily maximum rules. In the first, larger group of 18 countries, the statutory 48-hour maximum is in excess of average collectively agreed weekly working hours (see Figure 1 above) and of average actual weekly working hours (see Figure 5 below). The maximum appears to operate essentially as a safety net, although the 48-hour figure often includes overtime (TN0302101S). In the second group of 10 countries, the statutory maximum is much closer to average agreed or actual/usual weekly working hours and is identical to agreed working hours in some cases. This indicates a more active role for the law in governing working time; however, overtime may not be included in this figure. There was little change in this area between 2007 and 2008.
in the UK, weekly working hours may exceed 48 hours as long as this average is maintained over a 17-week reference period or longer in certain circumstances. The complexity of most countries’ rules relating to overtime and variable working time means that the maximum working hours set out in Table 1 cannot be compared directly, and that the differences between the groups of countries with maximum weeks of 40 hours and 48 hours may not be great in practice. in Spain, daily working time may be as high as 12 hours, by agreement, if the nine-hour average is maintained over a reference period. The data presented above relate to collectively agreed normal weekly working hours. A more accurate picture of how many hours workers really work in a given week is provided by statistics on actual weekly hours worked, typically measured in labour force surveys, which include factors such as overtime and absence. Therefore, Figure 5 below shows harmonised Eurostat data for the average number of actual weekly hours of work in the main job of full-time employees, based on its Labour Force Survey for the third quarter of 2008. These hours include all working hours, including extra hours, whether paid or not. In the EU, the longest actual weekly hours worked by full-time employees in their main jobs are found in the Czech Republic, Latvia, Poland and Romania, while the shortest are reported in Belgium, Finland, France and Ireland. The range between the shortest (France) and the longest (Romania) is 3.4 hours. Overall, 10 of the NMS12 have actual working hours above the EU27 average of 40.4 hours, compared with only four of the EU15. 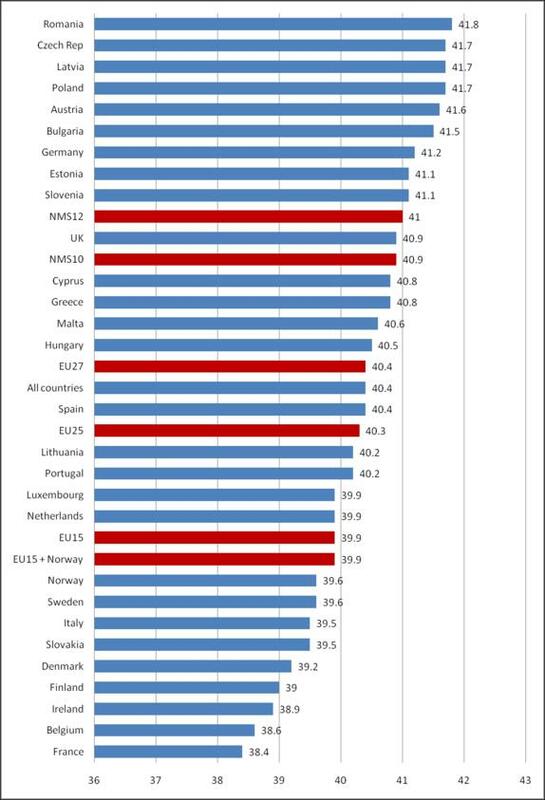 Of the NMS12, only Lithuania and Slovakia have below-average actual working hours. In the EU15, the longest actual full-time hours are worked in Austria, Germany and the UK, while the shortest are found in Belgium, France and Ireland. Actual weekly hours worked by full-time employees are higher than the average normal collectively agreed working week in all countries apart from Ireland, where actual working hours are shorter by 0.1 hours. In the EU27, average actual weekly working hours stood at 40.4 hours in 2008, compared with average collectively agreed weekly working time of 38.6 hours; the gap between the two rates amounts to 1.8 hours. The respective figures for the EU15 were 39.9 hours and 37.9 hours (a slightly wider gap, of 2 hours), and for the NMS12 they were 41.0 hours and 39.5 hours (a slightly narrower gap, of 1.5 hours). The average actual working week exceeds the agreed normal week by less than an hour in Greece, Hungary, Lithuania, Luxembourg and Malta. Actual working hours exceed agreed working hours by one to two hours in Belgium, Bulgaria, Estonia, Finland, Italy, Latvia, Poland, Romania, Slovakia and Slovenia. Hours actually worked are two to three hours more than agreed working hours in Austria, Cyprus, Denmark, the Netherlands, Norway, Portugal, Spain and Sweden, while this difference is over three hours in the Czech Republic, France, Germany and the UK. The gap between agreed and actual working hours is widest, at 3.7 hours, in the Czech Republic. Actual weekly hours worked by male full-time employees in their main jobs exceed those of their female counterparts in all countries considered, according to the Eurostat data, by an average of 2.2 hours across the EU27; the differential is slightly wider in the EU15 than in the NMS12. Men’s actual weekly working hours exceed women’s by three hours or more in Ireland, Norway and the UK, and by an hour or less in Bulgaria, Lithuania and Romania. An important factor in the overall duration of working time is the amount of paid annual leave to which workers are entitled. Figure 6 below shows the average number of days of collectively agreed annual leave for the 19 countries where data are available. The figures are harmonised on the basis of a five-day working week and generally apply to 2008. Collectively agreed annual leave is an area where data can be difficult or impossible to find. As a result, some of the figures provided are estimates – in several cases, rough ones – and no information can be given for a number of countries. This may be because the matter does not appear to have been researched or is not dealt with by collective agreements, or because the collectively agreed rules on leave entitlement are too complex to enable even a rough estimate to be produced. To take the example of Belgium, sectoral agreements may provide for a general addition of up to five days to the statutory minimum annual paid leave of 20 days. They may also provide for additional days of leave after a certain period of service, for example, one extra day after 10 years of service. Further additional days of leave may be given as compensation for workers with a normal weekly working time above the sectoral norm. Slovenia is another country where seniority and other criteria add to the minimum entitlement of 20 days in ways that make an average impossible to estimate. 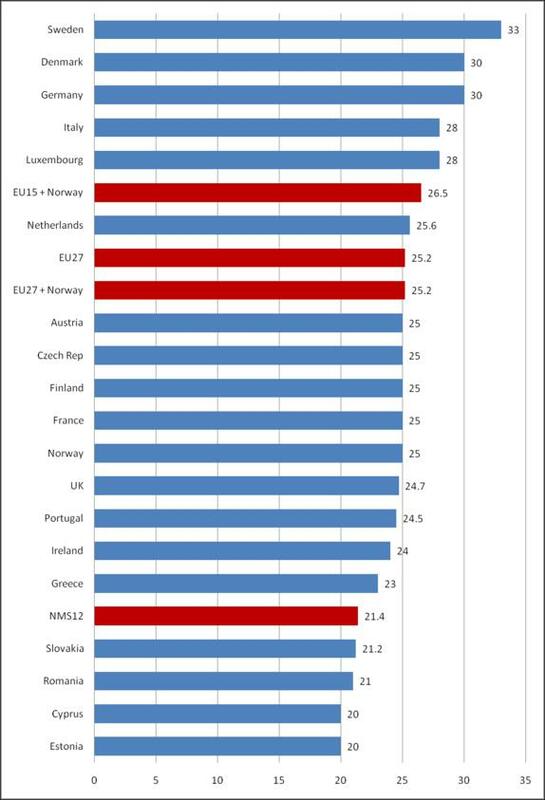 The average leave entitlement across the EU27 Member States for which data are available is 25.2 days. The average in the EU15 and Norway stands at 26.5 days and has increased slightly from 25.6 days in 2000, although the number of countries included and the calculation methods have not been uniform over this period. 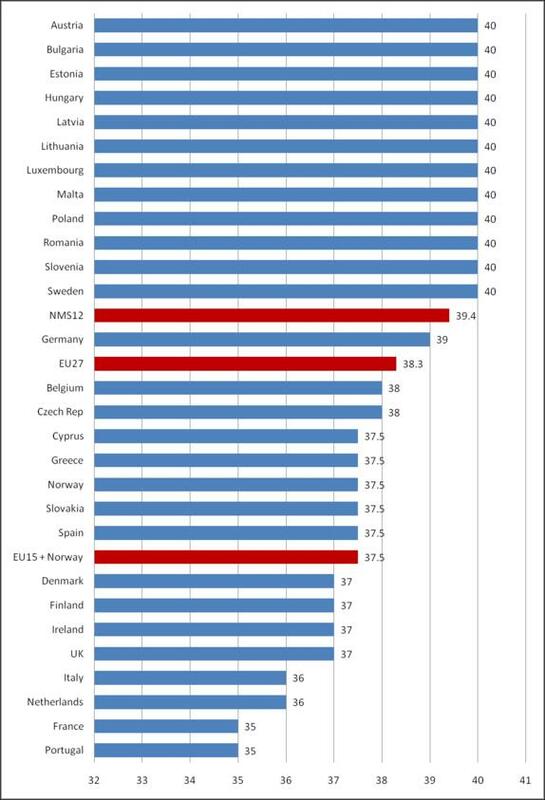 Agreed annual leave entitlement within the EU15 varies considerably, from 33 days in Sweden to 23 days in Greece. Among the NMS12, figures are available only for Cyprus, the Czech Republic, Estonia, Romania and Slovakia, where the average annual leave entitlement is 21.4 days. 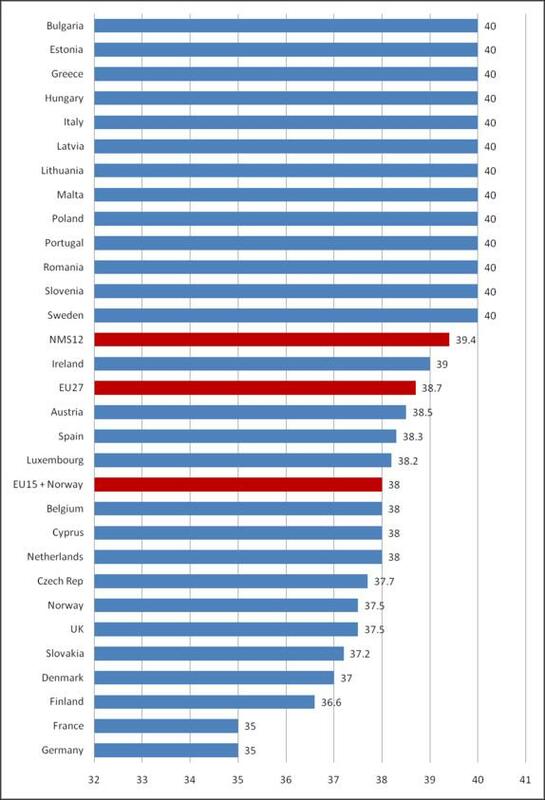 Among these countries, agreed leave is highest, at 25 days, in the Czech Republic. In most of the rest of the NMS12, apart from Slovenia (see above), annual leave is probably at the statutory level (see below), as it is in Cyprus and Estonia. Note: Due to limited data availability, ‘EU27 + Norway’ includes only 19 countries, ‘EU 27’ only 18 countries, ‘EU15 + Norway’ only 14 countries, and ‘NMS12’ only five countries. The data in Figure 6 should be read in conjunction with the notes in Annex 5. All of the 28 countries under examination have a statutory minimum period of paid annual leave, as set out in Table 3 below. In the table, the leave is expressed in days and harmonised on the basis of a five-day working week, and the data given are the basic entitlement; leave entitlement increases with length of service in some countries. The great majority of countries (18 out of 28) have a 20-day minimum leave entitlement, as laid down in the EU Working Time Directive – this group includes all of the NMS12 except Malta. Five countries have a 25-day minimum: Austria, Denmark, France, Luxembourg and Sweden. Meanwhile, the leave entitlement is 24 days in Malta and the UK, 22 days in Portugal and Spain, and 21 days in Norway. Average collectively agreed annual leave exceeds the statutory minimum by four or more days in the Czech Republic, Denmark, Finland, Germany, Ireland, Italy, the Netherlands, Norway and Sweden, suggesting that the law acts essentially as a safety net in these countries. Average collectively agreed annual leave and the statutory minimum are close or the same in Austria, Cyprus, Estonia, France, Romania, Slovakia and the UK – and also probably in most of the rest of the NMS12 – indicating a more active role for the law. Note: The data in Table 3 should be read in conjunction with the notes in Annex 6. Collectively agreed annual working time figures are available from national sources for a few countries, and are listed in Table 4 below. These figures may provide a more accurate measure of the duration of working time as they take into account factors such as leave, holidays and flexibility arrangements. Note: The data in Table 4 should be read in conjunction with the notes in Annex 7. In order to arrive at an approximate annual estimate for collectively agreed annual normal working time in all countries for 2008, this review has taken the figures for average collectively agreed normal weekly working hours (see Figure 1 above) and assumed a five-day working week and a 52-week year. From this total annual figure, the next step was to subtract the average collectively annual paid leave (see Figure 6 above) or, where no data are available on this point, the minimum statutory annual leave (see Table 3 above). It should be noted that for several countries, notably Belgium and Slovenia, average agreed leave, while impossible to calculate owing to the complexity of the rules, is undoubtedly considerably higher than the statutory minimum. The use of the latter in calculating collectively agreed annual normal working time thus makes the total figure rather higher than is in fact the case, rendering the estimates for these countries particularly crude. The number of annual public holidays was also subtracted, excluding those falling on Sundays. Where there are varying numbers of regional public holidays, as across the federal states (Länder) in Germany, an attempt has been made to give a mid-range figure. It should also be noted that additional holidays may be observed locally or on the basis of collective agreements or custom, while the number of public holidays may vary from year to year, especially in countries that do not award a substitute holiday when a public holiday falls at the weekend. These variations are the main source of year-on-year changes in annual working hours in many countries. The resulting annual figures do not, of course, take into account factors such as overtime working, or other forms of time off and leave. In short, they are only rough estimates, but they allow some broad observations to be made – see Table 5 below. In the EU27, average collectively agreed annual normal working time in 2008 stood at 1,744.2 hours. In the EU15, the figure stood at 1,696.5 hours, compared with 1,804.5 in the NMS12. Workers in the NMS12 thus work, on average, 108 hours a year (about 6.4%) more than their counterparts in the EU15 – the equivalent of over two and a half working weeks a year more. However, in some of the NMS12 – Cyprus, the Czech Republic and Slovakia – annual working time is not much more than the average for the EU15. However, in Greece and Ireland, annual working time is near or above the average for the NMS12. Overall, the EU’s longest working hours are in Estonia, Hungary, Poland and Romania, while the shortest working hours are in Denmark, France, Germany and Sweden. Average annual working hours in Romania are 288 hours higher (over 18% more) than those in France – the equivalent of about 7.2 working weeks in Romania. Looking at the ranking of the 28 countries in terms of the length of their agreed working hours, the countries with the longest weekly working hours are generally also those with the longest annual working hours, while countries with the shortest weekly working hours tend to report the shortest annual working hours. Nonetheless, the annual perspective results in rather different rankings for some countries than provided by the data for weekly working hours. Some Member States have a lower position in the ‘league table’ (that is, their working hours are shorter) for normal annual working hours (column F, Table 5) than that for normal weekly working hours (column A, Table 5 or see also Figure 1). In the examples of Germany, Luxembourg and Sweden, this disparity is due to the effects of relatively long annual leave (column C, Table 5). In the cases of Italy and Portugal, this dichotomy in the ranking for weekly and annual working hours is due to a combination of relatively long leave entitlements and a substantial number of public holidays (columns C and D, Table 5). On the other hand, some Member States have a higher position in the table (that is, their working hours are longer) for normal annual working hours than that for normal weekly working hours. This can be attributed to the effects of either a relatively low number of public holidays – as is the case in the Netherlands and the UK – or a relatively low number of days of annual leave, as in Belgium. In case of Belgium, however, the annual leave figures used are for minimum statutory leave, due to an absence of figures on agreed leave. The number of public holidays, excluding those falling on Sundays, varied in 2008 from 14 days in Spain to six days in the Netherlands. The average figure for the EU27 was 10.5 public holidays, with the NMS12 having more public holidays on average (10.9 days) than the EU15 (10.2 days). The total of agreed annual leave and public holidays (columns C + D, Table 5) varied in the EU from 42 days in Sweden to 28 days in Romania – a difference of 50% or almost three working weeks. 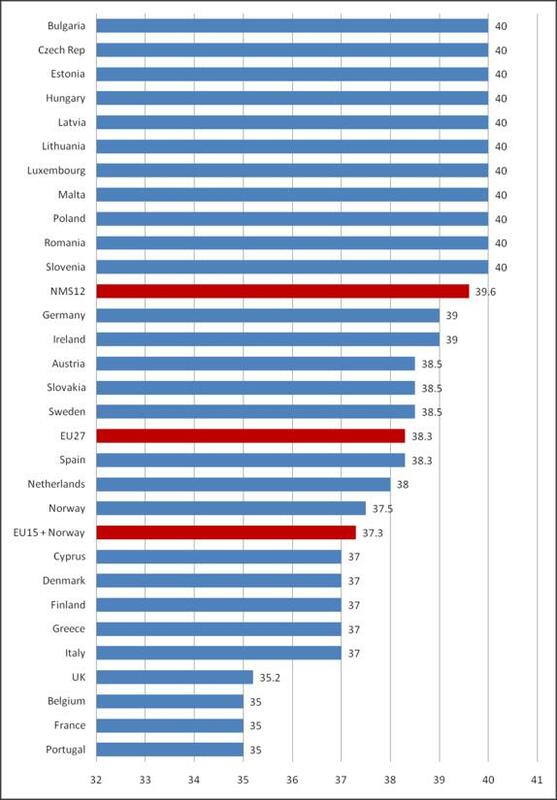 Other countries with notably high leave entitlements include Denmark, Germany and Italy, while countries with notably fewer leave days include Estonia, Hungary and Poland. The average figure for the EU27 was 34.2 days – 36.1 days in the EU15 and 31.8 days in the NMS. Note: * Statutory annual leave figure. Austria: figure is an estimate based on the most important collective agreements, which generally provide for working week of between 38.5 hours and 39 hours. Belgium: figure is an estimate calculated by the Federal Public Service for Employment, Labour and Social Dialogue (SPF Emploi, Travail et Concertation sociale/FOD Werkgelegenheid, Arbeid en Sociaal Overleg) on the basis of sectoral collective agreements in the private sector; this excludes the effects of company agreements. Bulgaria: figure refers to the normal week – which is also the statutory figure – set in the great majority of agreements. Cyprus: figure is from Cyprus Labour Institute (Ινστιτούτο Εργασίας Κύπρου, INEK-PEO) of the Pancyprian Federation of Labour (Παγκύπρια Εργατική Ομοσπονδία, PΕΟ). Czech Republic: figure is from the Information System on Working Conditions (ISWC) and Czech-Moravian Confederation of Trade Unions (Českomoravská konfederace odborových svazů, ČMKOS). It refers to hours set by company-level collective agreements, the more prevalent bargaining level. According to ČMKOS, about 53% of higher-level collective agreements signed by its affiliates in 2008 set normal weekly hours at 37.5. Denmark: figure refers to almost all collective agreements. Estonia: as set by law; according to the Confederation of Estonian Trade Unions (Eesti Ametiühingute Keskliit, EAKL), few cases arise of collective agreements reducing normal hours below the statutory figure. Finland: figure is an estimate, based on typical provisions of sectoral collective agreements. France: since 1 January 2002, normal weekly working hours must, by law, be set at 35 hours in all companies; those with fewer than 10 employees have an exemption scheme relating to overtime. Germany: data are from the collective agreement archive of the Institute for Economics and Social Science (Wirtschafts- und Sozialwissenschaftliches Institut, WSI); the data cover the whole of Germany. Greece: figure refers to most collective agreements. Hungary: collective agreements usually lay down the statutory working week of 40 hours. Although the Labour Code allows collective agreements to stipulate a shorter period, in practice deviations from the statutory hours are relatively rare. Ireland: figure refers to most collective agreements. Italy: figure represents the mid-range of collective agreements, which provide for 36–40 hours per week. Latvia: as set by law. Lithuania: as set by law. Luxembourg: figure is an estimate, dating from 2005, without any major changes having been reported since then. Malta: while no statistical data exist, most collective agreements specify a normal weekly working time of 40 hours. Netherlands: figure is an estimate, based on a sample of collective agreements. Norway: figure represents normal working hours for employees covered by collective agreements; employees working shifts or at night work fewer weekly hours. Poland: as set by law. Portugal: figure is for 2006 from the employment survey of the Office of Strategy and Planning (Gabinete de Estratégia e Planeamento, GEP) within the Ministry of Labour and Solidarity (Ministério do Trabalho e da Solidariedade Social, MTSS); it refers to ‘normal average working time’ (no more recent data are available). Romania: as set by the tripartite national collective agreement, which provides a minimum basic framework for employment conditions, and by sectoral collective agreements. Slovakia: figure refers to workers in single-shift systems – in 2008, the equivalent figure for workers in two-shift systems was 37.4 hours, in three-shift systems 36.9 hours and in continuous shifts 36.8 hours; data from Information System on Working Conditions (ISWC), Trexima Bratislava. Slovenia: figure is based on the standard in sectoral collective agreements; same figure is set by law. Spain: figure is from collective bargaining statistics of the Ministry of Labour and Immigration (Ministerio de Trabajo e Inmigración, MTIN); average agreed annual working hours amounted to 1,751.2 hours in 2008, on the assumption of a six-day week and 274 working days a year. Sweden: figure from Statistics Sweden (Statistiska Centralbyrån, SCB). UK: figure from Incomes Data Services (IDS) ‘Hours and holidays’, September 2008, based on a study of about 420 organisational and industry agreements. Belgium: figure is for blue-collar workers in metal, mechanical and electrical engineering (joint committee 111) and white-collar workers in metal engineering (joint committee 209); agreements within these committees are differentiated by province and/or subsector, and in general set normal weekly working time at 38 hours; these agreements are amended at company level by working time reductions and/or the use of flexible working time regimes. Bulgaria: as set by law; weekly working hours are set at 35 hours for workers in high-risk occupations and workplaces with arduous working conditions. Cyprus: figure from the Cyprus Metalworkers Mechanics and Electricians Trade Union (Συντεχνία Εργατοϋπαλλήλων Μετάλλου, Μηχανοτεχνιτών και Ηλεκτροτεχνιτών Κύπρου, SΕΜΜΗΚ) which is affiliated to PEO. Czech Republic: figure is from ISWC and refers to working hours set by company-level collective agreements, which is the more prevalent bargaining level in the country; the collective agreements are signed by the Czech Metalworkers’ Federation (Odborový svaz KOVO, OS KOVO). Estonia: as set by law; there are no reported cases of collective agreements reducing normal working hours below the statutory level. France: a 35-hour working week is assumed, on the basis of legislation – see note to Figure 1 in Annex 1. Germany: figure is from the WSI collective agreement archive and applies to western Germany; the figure for eastern Germany was 38 hours. Hungary: working hours may be lower in hazardous jobs. Luxembourg: figure is from the Luxembourg Confederation of Independent Trade Unions (Onofhängege Gewerkschafts-Bond Lëtzebuerg, OGB-L). Malta: figure is an estimate, based on provisions of the Transport Equipment, Metal and Allied Industries Wages Council Wage Regulation (Amendment) Order 1990 (L.N. 45). Netherlands: figure is an estimate based on sectoral agreement’s annual figure of 1,736 hours a year, assuming 25.6 days annual leave and six public holidays. Portugal: figure is based on collective agreements signed by the major metalworking trade unions; some collective agreements in metalworking provide for a 39-hour week for white-collar workers only. Slovakia: data are from ISWC. Spain: figure is calculated from the MTIN collective bargaining statistics on average agreed annual working hours for the whole industry sector (1,750 hours in 2008), not solely metalworking, on the assumption of a six-day week and 274 working days a year. UK: figure is from IDS (see notes to Figure 1 in Annex 1) and is for ‘engineering (including electronics)’. Belgium: figure is for banking (joint committee 310), excluding small savings banks; the sectoral agreement sets a basic rule of 35 hours a week and 1,650.2 hours a year. Bulgaria: as set by law. Cyprus: figure is from the Cyprus Union of Bank Employees (Ένωση Τραπεζοϋπαλλήλων Κύπρου,ΕΤΥΚ). Czech Republic: figure is from ISWC and refers to hours set by company-level collective agreements, which is the more prevalent bargaining level in the country. Estonia: as set by law. Germany: figure is from the WSI collective agreement archive. Italy: for security staff in banks, agreed weekly working time stood at 39.5 hours. Malta: estimate is based on major collective agreements in the sector. Netherlands: figures are based on a sample of company collective agreements. Portugal: figure is based on collective agreements signed by the Banking Trade Union of the South and Islands (Sindicato Bancários do Sul e Ilhas, SBSI), affiliated to the General Workers’ (Union União Geral de Trabalhadores, UGT). Romania: as set by the tripartite national collective agreement; no sectoral agreement exists in Romania. Spain: figure is calculated from the MTIN collective bargaining statistics on average agreed annual working hours for the whole services sector (1,750.8 hours in 2008), not solely banking, on the assumption of a six-day week and 274 working days a year. Austria: usual figure for local government employees; working time fixed by law or decrees. Belgium: statutory norm for the public sector. Cyprus: figure is from the Pancyprian Public Employees Trade Union (Παγκύπρια Συντεχνία Δημοσίων Υπαλλήλων, PASYDY). Czech Republic: figure is from ISWC and refers to working hours set by company-level collective agreements. France: a 35-hour week is assumed, on the basis of legislation – see note to Figure 1 in Annex 1 above. Germany: figure is from the WSI collective agreement archive and applies to western Germany; the figure for eastern Germany was 40 hours. Luxembourg: as set by law. Malta: figure refers to working hours set by collective agreement for clerical workers in local councils. Portugal: as set by law. Spain: as set by the Civil Service Statute. Sweden: local government workers performing night or weekend work have shorter weekly working hours. UK: figure is from IDS (see note to Figure 1 in Annex 1 above); local government employees in London have a 36-hour working week and craft operatives in Scotland have a 39-hour working week. The data in Figure 6 should be read in conjunction with the following notes. Austria: as set by law, expressed as 30 working days, including Saturdays. Czech Republic: figure is from ISWC and ČMKOS, and refers to leave (expressed as five weeks) set by 52.9% of higher-level collective agreements signed by ČMKOS affiliates and 78% of company-level collective agreements in 2008. Denmark: comprising five weeks of annual leave, plus five days to be taken at employees’ own choice or paid instead. Estonia: as set by law, expressed as 28 calendar days; according to EAKL and the Estonian Employees’ Unions’ Confederation (Teenistujate Ametiliitude Keskorganisatsioon, TALO), some collective agreements provide for annual paid leave of three to five days above the statutory level, but no exact data exist on the number of such agreements. France: as set by law, expressed as 30 working days, including Saturdays; the number of days increases with length of service. Germany: data are from the WSI collective agreement archive. Greece: mid-range of entitlements which vary from 20 to 25 days, depending on service. Italy: figure calculated as four weeks’ leave, plus the mid-range of between five and 10 days awarded as a form of working time reduction. Luxembourg: figure is an estimate, dating from 2005. Netherlands: figure is an estimate. Portugal: 24 or 25 days is the agreed norm, with the 25th day sometimes dependent on factors such as age and attendance. Romania: figure is the minimum laid down in the national collective agreement. Slovakia: figure is an estimate, based on the fact that – according to ISWC – 23.6% of sectoral collective agreements signed for 2008 provided for one week’s leave above the statutory minimum. Sweden: figure is calculated as the statutory 25 days, plus the mid-range of between five and 10 days additional leave awarded in most collective agreements. UK: figure is from IDS ‘Hours and holidays’, September 2008. Austria: expressed as 30 working days, including Saturdays; it increases by five days after 25 years of service. Belgium: figure refers to the private sector; minimum statutory entitlement in the public sector is 24 days. Bulgaria: higher statutory leave entitlements apply to groups such as young and disabled people, and workers in hazardous work or working irregular hours. Cyprus: 25 days for those working a six-day week. Czech Republic: leave entitlement is expressed as four weeks. Estonia: leave entitlement is expressed as 28 calendar days. Finland: entitlement is two days of leave, including Saturdays, per calendar month worked in first year of the employment relationship, and 2.5 days per month thereafter. France: leave entitlement is expressed as 30 working days or five weeks. Germany: leave entitlement is expressed as 24 work days, that is, Monday to Saturday. Greece: 24 working days for those working a six-day week, leave entitlement increases after one year of service. Italy: leave entitlement is expressed as four weeks. Latvia: leave entitlement is expressed as four calendar weeks. Lithuania: leave entitlement is expressed as 28 calendar days – certain groups, such as people with disabilities and lone parents have an entitlement of 35 calendar days. Malta: leave entitlement is expressed as four working weeks and four working days. 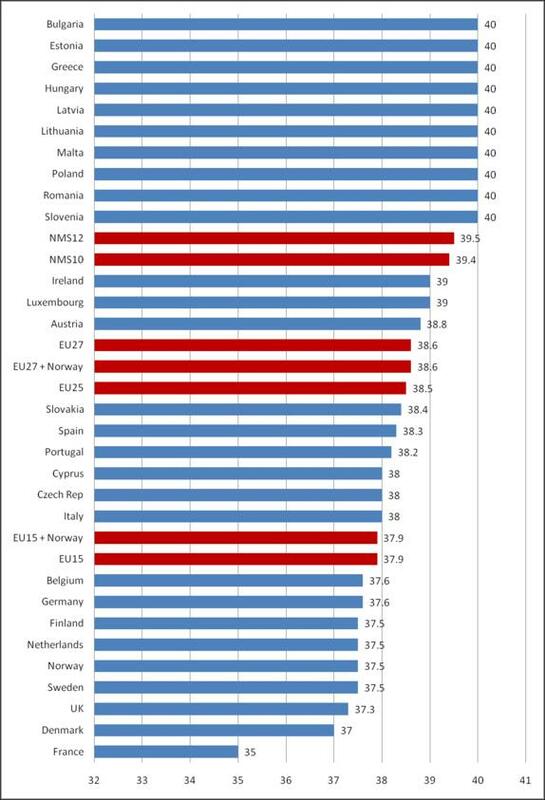 Poland: leave entitlement rises from 20 days to 26 days after 10 years of employment. Slovakia: leave entitlement is expressed as four weeks. Slovenia: leave entitlement is expressed as four weeks; older workers, workers with disabilities and those taking care of disabled children are entitled to at least three additional days, and workers under the age of 18 years entitled to seven additional working days. Leave entitlement increases for parents by one day a year for each child under the age of 15 years. Spain: expressed as 30 calendar days. UK: the statutory entitlement will rise from 24 days to 28, including eight public holidays, from April 2009. France: figure is from National Institute for Statistics and Economic Studies (Institut National de la Statistique et des Études Économiques, INSEE); 2008 figure is for first three quarters of the year only. Germany: data are from the WSI collective agreement archive and cover the whole of Germany. Italy: data are from the Central Bank of Italy (Banca d’Italia). Malta: data are from National Statistics Office (NSO). Romania: figures, which exclude overtime, are estimates based on provisions of national and sectoral collective agreements. Spain: figures are from MTIN labour statistics.